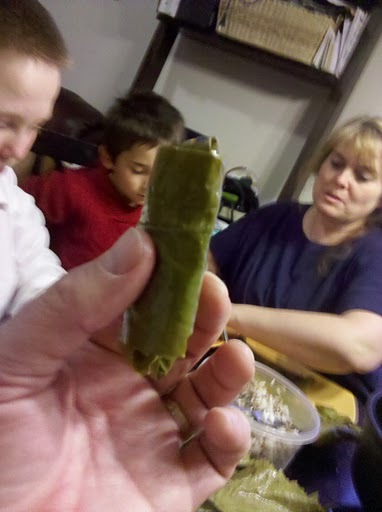 When I first heard of dolmades (or “dolmas”, or just “rolled grape leaves”), I was kinda grossed out. It didn’t sound very good. But once I had tried them, I was hooked. I love these things! And when I started doing dutch ovens, I knew that at some point I was going to try to make them. My wife’s cousin, Michelle, knows how to cook a lot of Middle-eastern and Mediterranean foods, so I asked her to come over and show me. So, she did! There was one major miscommunication, that I somehow missed, and I cooked the rice before hand. Shouldn’ta done that. But other than that, it all turned out. The idea was to kind of do a whole greek/middle eastern meal: Dolmades, a chicken/rice/lemon soup, and baklava. It didn’t turn out quite as I had anticipated. I think I shoulda taken it a bit at a time. The soup was blah, but the dolmades and the baklava turned out great. As I was preparing to write up the recipe, here, I did a little research, and confirmed some things I already kind knew. Like, that there are soooo many variations of this dish that you really can’t do it wrong. Even from family to family, the flavor and the recipes change so much. It all remains similar, but don’t be afraid to make it your own. 12-15 coals above and below for the final cooking. This adventure started by putting about 20 coals under a dutch oven with a little oil in the bottom. I diced up an onion and minced the garlic cloves and, when the oil was hot enough, tossed them in to saute. If they sizzle and jump right away, you know it was hot enough. I ground on a little salt, too. Once the onions were browned a little, I added in the meat. This time, I used ground turkey. If I can acquire it next time, I’ll use lamb, but ordinary ground beef is ok, too. As that was browning, I added in the baharat. Baharat is a mix of spices commonly used in middle eastern cooking. You can buy it at a specialty market, or using the wikipedia as a guide, mix your own. Really, the seasonings and the flavorings are completely up to you. Again, there are so many regional and familial variations on this dish that you really can’t go wrong. Once this is cooked, I pulled it off the heat and let it cool some. Then, I added in the rice. Don’t cook the rice. That was a mistake I made. With all this, the filling is ready. I rinsed out the dutch oven, and wiped it down. I spread a little olive oil in the bottom, and we got ready to roll the dolmas. One suggestion that Michelle made was to spread a layer of chopped tomatoes over the bottom of the pan, to raise up the dolmas and make them not burn or stick to the pan. That sounded like a great idea, but we didn’t have any tomatoes. You try it and tell me how it works. 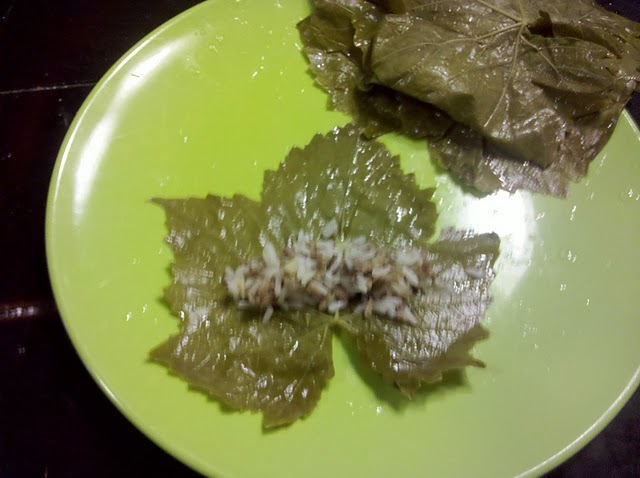 Instead, we covered the bottom of the pan with one layer of flat grape leaves. 1. Separate out a grape leaf, and pinch off any of the stem that’s left. 2. Lay it flat, with the vein side up, and unfold it, if there are any folds. 3. Spread a finger-width spot of filling (about 2 finger joints long) on the leaf. Put it just above where the stem was. (see the picture). 4. Fold the lower part of the leaf up and over the filling. 7. 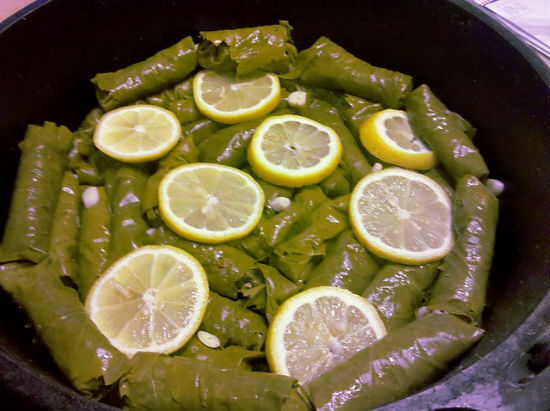 Place it on the leaves or the tomatoes in the bottom of the dutch oven, making a single layer of dolmas. 8. Keep going. You can add on a second layer if you have enough leaves and filling. After we’d rolled up all of our filling, I added some of the garlic slices and lemon slices on top. Then we poured on the stock. The dolmas tended to float a little, and Michelle said you can put a plate on them to weigh them down. This went on the coals. As I did some research afterward, some people cook them in a skillet, uncovered. I used the coals listed above, with the dutch oven lid on, half above, half below. You don’t need to cook it long, just to cook the rice and the leaves. Maybe about 10-15 minutes, once it’s boiling. I would watch for venting steam out of the lid of the dutch oven, and pull them off about 10 minutes or so later. Now, at this point, we were pretty busy making the soup and the baklava, so I didn’t make any of the cucumber yogurt sauce (tzatziki) that I love so much with dolmades. But I added a link to the recipe. So, on to the Baklava! hey mark we are doing our affiliate blog homework and you are making us poor LDS folk hungry. WAY TA GO!